The EOS 1D-X was the first high-speed action camera from Canon featuring a full-frame CMOS image sensor, an entirely new product for Canon. 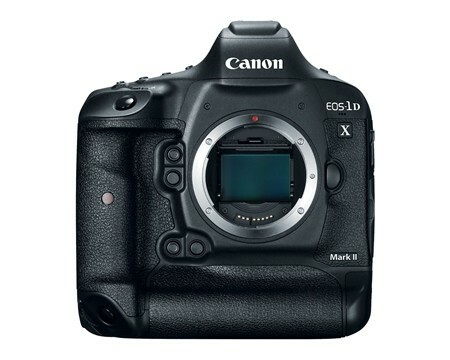 The EOS-1D X Mark II appears to be an evolutionary step along that path. Below, Chuck Westfall, Technical Adviser at Canon U.S.A. Inc. sheds more light on the features of the new EOS-1D X Mark II and the improvements relative to its predecessor, especially for wildlife and avian photographers. AH: What is the main feature/highlight of the new EOS-1D X Mark II compared to the original EOS-1D X? CW: The EOS-1D X Mark II delivers significant improvements in overall image quality, features and performance while maintaining a classic look and feel that makes it easy for current EOS-1D X owners to use. At its core, the EOS-1D X Mark II honors the original EOS-1 system concept of a high-performance camera designed for professional imaging creators, seamlessly integrating Canon’s latest technological advancements including DIGIC 6+ image processors and Dual Pixel CMOS AF. AH: In addition to the very modest increase in resolution from 18 to 20 Mega-pixels, what improvements have Canon made to the CMOS image sensor that would translate to a higher image quality when shooting in RAW (CR2) format? 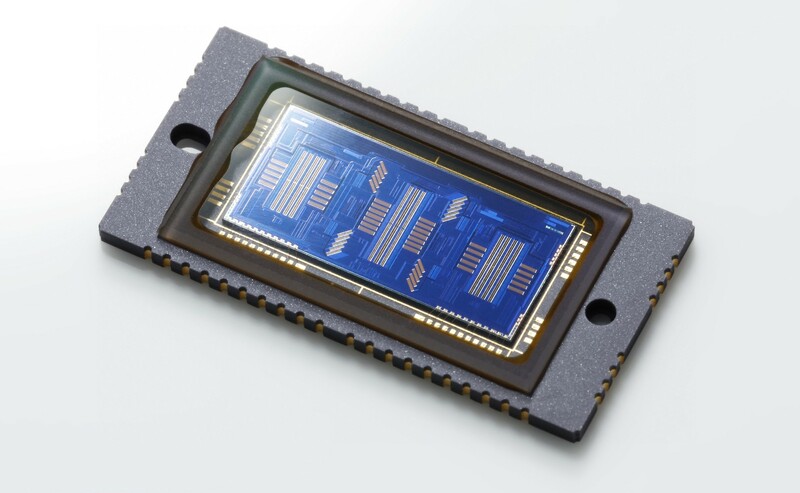 CW: In addition to the first implementation of Dual Pixel CMOS AF in a full frame image sensor, the EOS-1D X Mark II showcases the latest Canon image sensor technologies such as new photodiode construction, new color filters, and greater photo-electric conversion efficiency. In plain English, the new image sensor delivers higher image quality at all ISO speeds for both RAW image data and JPEG files. AH: We can imagine that Canon could have opted for a higher resolution sensor while keeping the camera at 12 fps. What guided Canon’s product development to specify an even higher frame rate instead? Did the hardware requirement associated with 4K video recording influence this decision at all? CW: We carefully evaluated the anticipated needs and priorities of current and future image makers in a variety of specialties including sports, photojournalism, commercial, nature, wildlife, wedding and portraits, etc., and did our best to produce a professional tool that would exceed all of their expectations. The integration of DCI-4K/60P video in this camera is a clear acknowledgment of the growing importance of high-quality video for professional applications, but at the same time we were able to significantly upgrade the performance of this camera for many still photography assignments. AH: What are the main hardware and software improvements incorporated in the the new 61-point high-density reticular AF II system compared to the original system in the EOS-1D X? 1. Low-light sensitivity has been doubled to EV -3 at the center AF point when the camera is set to One-Shot AF. This makes the new camera easier to use in extremely low light. 2. AF point illumination in the viewfinder has been significantly enhanced, making the EOS-1D X Mark II easier to use in a wide variety of shooting conditions. 3. All 61 AF points remain active even with lens/extender combinations featuring a maximum aperture of f/8 (compared to center point-only AF with the EOS-1D X under the same conditions). 4. AF coverage across the image area has been expanded by up to 24% compared to the EOS-1D X, and we have added Zone AF for greater compositional flexibility. The new reticular II AF sensor used in the EOS-1D X Mark II. 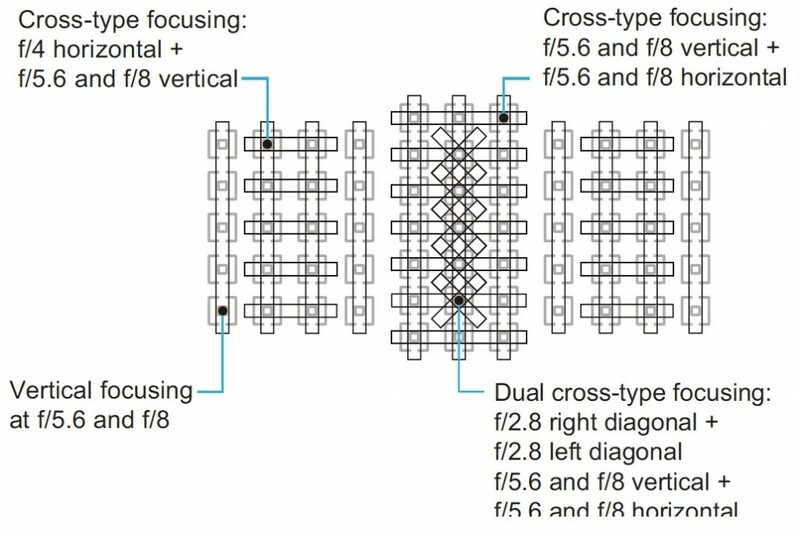 Image Courtesy Canon U.S.A.
AH: How many AF sensors are cross-type capable at f/4, f/5.6 and f/8 respectively? Up to 41, 21 and 21 respectively. However, the number of active AF points varies according to the lens in use, not just the maximum aperture. As with the EOS-1D X, EF lenses are classified into Groups from A to L. The camera’s instruction book illustrates the number and distribution of active AF points according to Group. The AF array of EOS-1D X Mark II (left) compared to EOS-1D X (right). AF line sensor arrangement of the EOS-1D X Mark II. AH: What specific improvements can wildlife photographers expect from the EOS-1D X Mark II when shooting with the series II super-telephoto lenses that have a maximum aperture of f/4 ? How about super-telephoto lenses with EF extender 1.4X III or 2X III attached (maximum aperture f/5.6 or f/8)? All EOS-1D X Mark II users can expect overall improvement in AF coverage area and low-light sensitivity. The most notable improvement in AF coverage occurs with lens/extender combinations that have an effective maximum aperture of f/8, because all 61 AF points remain usable in this case compared to center-point only with other EOS models such as 1D X, 5D Mark III, 7D Mark II, etc. The enhanced low-light sensitivity is expected to be particularly beneficial to photojournalists, sports, nature and wedding photographers who frequently shoot in low-light environments. And last but not least, the illumination of the AF points in the viewfinder is vastly improved compared to the 1D X. This is a welcome upgrade for most if not all EOS-1D X Mark II users. AH: In contrast to sports photography, when shooting birds in flight against varied backgrounds, photographers often have to manually select the center AF point (with expansion). They often cannot rely on the fully-automated tracking such as iTR which relies on subject recognition and automatic focus point selection. This is due to the erratic nature of the subject itself, its size in the frame as well as the background that is often the same color as the subject. What improvement in terms of AF speed and accuracy does the EOS-1D X Mark II bring to the table in this particular scenario? We encourage EOS-1D Mark II users to try the new AF system for themselves before reaching any conclusions about possible limitations based on the performance of other cameras. AH: Are Canon committed to the CFast platform? Why CF+CFast as opposed to a dual CFast interface? Dealing with two types of storage media is often cumbersome and less cost-effective for the photographer. The performance advantages of the CFast format such as faster write speeds benefit many EOS-1D X Mark II users by supporting several feature improvements including 4K/60P video and superior buffer memory performance for continuous shooting during still photography. At the same time, we recognize that many professionals still own significant quantities of standard CF cards, and we want to make it easier for them to preserve the value of their investments in those cards. AH: what functions are controlled by the touch screen? Can it be disabled? We can imagine it is not very useful when user is wearing thick gloves or in wet conditions. The functionality of the touch screen on the EOS-1D X Mark II is limited exclusively to focusing point selection for video recording. It is disabled for all other functions, and can also be disabled completely if desired. AH: In an era of smartphones why Canon opted to include the GPS module built-in while the highly-desired WiFi transmitter is still an optional external module? Maintaining the WiFi transmitter as an optional accessory enabled us to upgrade the signal protocol of the new WFT-E8A to dual-band IEEE 802.11ac for faster data transmission with less potential for signal interference. This design also makes it easier to upgrade the transmitter to newer signal protocols as they are developed. AH: With every new EOS-1D series camera, Canon appear to have put more emphasis on the video functionality. However, many working professional photographers remain committed and focused on still photography only. Why not offer the video functionality as an option to reduce the baseline price of the camera for those who don’t shoot video? The idea that selling price would be significantly reduced by the omission of video capabilities in a modern professional DSLR is a misperception. Furthermore, the ability to produce high-quality video for professional assignments, now up to 4K/60P, increases the versatility of the EOS-1D X Mark II and expands its appeal to a much larger group of potential customers. The larger the target audience, the greater the potential to keep selling prices as affordable as possible. This benefits all customers. AH: What are the specifications of the new batter pack? Is the camera compatible with the older LP-EN4? The new LP-E19 battery pack is a 2700 mAH device running at 10.8 volts. In addition to the LP-E19, the EOS-1D X is also compatible with existing Canon LP-E4N and LP-E4 battery packs; However, maximum continuous shooting speeds are reduced to 12 fps through the viewfinder and 14 fps with the mirror locked up when using the older batteries (versus 14 fps and 16 fps respectively using the LP-E19). Users can charge LPE-4, LP-E4N and LP-E19 battery packs on the new Battery Charger LC-E19. However, LP-E19 battery packs cannot be charged on Battery Charger LC-E4 or LC-E4N. (c) 2016, Arash Hazeghi, all rights reserved. I really look forward to your field testing Ari. 1 – -3EV for only one centre point ?!! EV -3 at the center AF point when the camera is set to One-Shot AF. mm that’s not going to help much say when after an Owl flying as the light drops . hello, can i use the newer LP-e19 battery in the 1D mark IV camera ? Could have better image quality in landscape photography vs higher mega pixels camera like 5dsr? This camera’s resolution is significantly lower than the 5DsR. It is not meant for landscape shooters, it is an action camera. Chuck’s response related to the dual functionality of modern DSLRs is simply not credible. The fact is, Canon has decided you’re getting a dual function DSLR no matter what. It’s likely because Canon cannot allocate engineering resources to developing a separate 1D design that doesn’t not include video. Either way, the cost of 1D DSLRs has almost tripled since Canon added video to their designs. This massive cost increase is not due to inflation and it certainly isn’t due to supply and demand as world wide DSLR sales have been declining. Dual functionality on DSLRs a bit like going to your local car dealer and being told that new car you love comes with a snow plow blade when you live in Florida. Personally I’ve shot less than five minutes of video on the three 1Ds I have that support video. @Jay The lower the sales volume = the higher the per unit R&D cost. Flagship models are not like entry level DSLRs that are more like commodities. It is quite possible that if Canon did develop both a video and non-video version of the 1D X Mark II, *both* versions would need to cost more than the current price for a single version to cover the increased R&D cost of developing two versions. Also keep in mind that the same faster data rates and deeper memory buffers needed to support high resolution video are what allows faster and longer bursts of still images. Would you really want a “stills only” 1D X Mark II that could only shoot at 12 fps for 38 raw images if the “video” version could go at 14 fps for 170 raw images? Just to save 10% off the cost of the camera, if you saved anything at all? Based on Chuck’s statements in the past, One Shot is about 2 stops better than AI Servo in very low light. It’s been that way on every 1 series camera Canon has ever released. Based on the laws of physics the center point will always get the most light coming through the lens (unless an optical element is VERY decentered and then nothing is going to be in focus anyway). The 1D X is sensitive down to EV -2 which means AI Servo is about EV 0 at the center point. The 1D X Mark II is sensitive down to EV -3 which means AI Servo is about EV -1 at the center point. You’ve still gained one stop in AI Servo just as you have in One Shot. unfortunately this is incorrect on multiple fronts: Chuck did not say anything about single shot vs. AI-servo sensitivity. The center point was not more sensitive in low-light in previous EOS 1D cameras. It was a double-cross type sensors which makes it more sensitive to 45 degree contrast but not to lower light. In lower light focus takes longer to lock, for one-shot AF that’s not an issue but in AI-servo if the focus cannot be locked in a short amount of time the camera will give up tracking. So you cannot simply define a focus sensitivity threshold for AI-servo and that’s why Canon do not disclose such number.